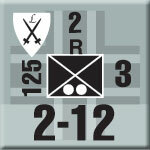 When we located enough parts – maps and playing pieces – to bring our gigantic Alamein game back into print (we’re printing more of the rules, scenarios charts and stuff, and a new box), I recalled that we had another more-or-less forgotten item: a set of 140 variant pieces, once intended as a downloadable extra. For a very limited time (until Saturday July 15th, 2017) we’re offering these with a set of “real” playing pieces: mounted, laser-cut and very nicely printed. They’re available only to the Gold Club. We only have a few copies of Alamein remaining, so we’re not likely to ever offer these again. 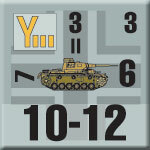 I originally intended to create three such downloads, one each for German, Allied and Italian variants. Expansion Set One, our current offering, is the German segment. I think we’re likely to offer the other two later this year, since we’ve gotten a good response to the first one and the world needs more Egyptian wargame units. So what do you get with Alamein Expansion Set One? To start with, you get that sheet of 140 laser-cut pieces. They’re a little bit thicker than the standard pieces of Alamein; that’s a function of the production process. They’re smooth on both sides, unlike a die-cut playing piece. All of them are German pieces, in the same color scheme as the Germans of Alamein: gray with the Maltese cross ghosted into the background, with their divisional symbol (if applicable) in the upper left corner. That symbol’s not just a decoration; formation organization is very important in this game. There are two new formations in the Expansion Set, plus one heavily revised one. The 164th “Iight Africa” Infantry Division appears in the standard Alamein game, but it’s overrated there with greater combat strengths and morale than its infantry battalions deserve in game terms. We bring it closer to reality, with weaker firepower and less-enthusiastic morale. The 164th Light Africa Division had been formed from the scrapings of the German garrison on Crete, and lacked for heavy weapons and officers as well as competent soldiers. Even so, the Germans planned to motorize this motley collection, and so we’ve provided the pieces for a motorized version of the 164th Light Africa Division, which will help it run away from combat far more effectively than it did in the actual battle. The other two new formations are much different: powerful, competent divisions that can make a real difference on the battlefield. After the fall of Tobruk, Erwin Rommel received his field marshal’s baton and famously quipped that he would rather have another panzer division. This variant gives him his additional division. The 10th Panzer Division was a veteran outfit that had seen action since the invasion of Poland ad would eventually fight in Tunisia. It is a powerful formation, with three tank battalions instead of the two possessed by Rommel’s existing panzer divisions (the 15th and 21st) and four motorized infantry battalions rather than three. And on top of that, those tank battalions are fully-equipped with the most modern machines, where the Afrika Korps divisions have a mix of new and less-new. That gives them one extra step of strength (five steps rather than four) and greater firepower as well. The other new division is also a veteran outfit. The 22nd Air-Landing Division made its mark in the Netherlands in 1940 and the southern Soviet Union in 1941, but afterwards went to Crete to restore its strength. That never happened, but the German command planned to restore it to full strength as a “Tropical-Motorized Air-Landing Division” and send it across the Mediterranean to join Rommel. The 22nd gives the Afrika Korps another powerful formation: it has its own armor support in the form of a tank battalion, though it’s not a very good tank battalion (it’s equipped with captured French tanks). It does bring six very good motorized infantry battalions plus the usual array of recon troops, artillery and engineers. Those additions of course raise the question: if all of those powerful units could have been sent to North Africa, why weren’t they? The Axis supply chain could only bring up so much food, ammunition and fuel. Had two more divisions joined the Afrika Korps, other troops would have to have been left behind. And Benito Mussolini could not allow the war in North Africa to become a completely (or even mostly) German endeavor. In game terms, if you get these divisions, you lose a couple of others. On top of that, the Allied side had many more troops that could have been sent to Egypt to stop Rommel: Polish exiles, African brigades, Egyptians, Australian and Indian armored divisions. And those formations are the subject of Expansion Set Two. Don’t wait to put Alamein Expansion Set One on your game table! Join the Gold Club and find out how to get it before it's gone forever!